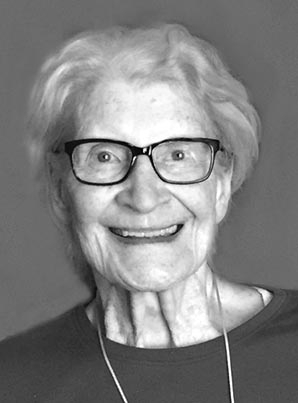 Bee was artistically inclined, participating in singing groups throughout her life, including St. Mary’s Choir and Acting Group in Janesville, the St. Francis Church Choir, and Silvertones, and she was also a talented drawing artist. Bee was an avid traveler with the Prime Time Club. She was known by her friends and family to be gracious and kind, to have had an incredible sense of humor and willing to partake in any experience. It is very likely that you may have traveled with her near or far, bowled in a lane with or next to her, or played cards or Bingo with her. Bee was predeceased by her “Dear One”, her husband, Butch, in 1986; her parents, Sigmund and Anastastia; her sister, Josephine; her brother, Alfons; a baby son in 1962; and many other family members. She is survived by her children, Joseph (Ann) Bowar of Littleton, CO, Amy Bowar of Janesville, Thomas Bowar of Englewood, CO, Carol (Ted Halbert) Bowar of Broomfield, CO, and Sara (Mark) Hanson of Middleton; her grandchildren, Jake, Luke, Matthew, and Timothy Bowar, Ian and Ace Litten, Isaac, Adam, and Lydia Hanson, and Eleanor (Ellie), Tate, and Josephine (Joey) Halbert; her sister, Anastasia (Stell) Protteau of Texas; sister-in-law, Lucille (Frank) O’Connor; and so many nieces and nephews and grand nieces and nephews. A Mass of Christian Burial will be held at St. Francis Xavier Catholic Church, 2947 Thinnes St., Cross Plains, at 11 a.m. on Jan. 25, with Rev. Msgr. Gerard Healy presiding. A Catholic Rosary with the Knights of Columbus will take place prior to the Mass at 10:30 a.m. Burial will follow the Mass at the church cemetery. Visitation will be held at the church from 3 p.m.-7 p.m. on Jan. 24, and again from 9 a.m. until the start of the Mass on Friday. Bee’s family is so incredibly grateful for her community of friends, including those from the State Bank of Cross Plains, St. Francis Xavier Church, Northwest Dane Senior Services, and the Prime Time Club. Your friendship and support of Mom provided her with many, many adventures, and years of love and laughter, for which we are so deeply appreciative. In lieu of flowers, please make donations to St. Francis Xavier Endowment Fund or Northwest Dane Senior Services.